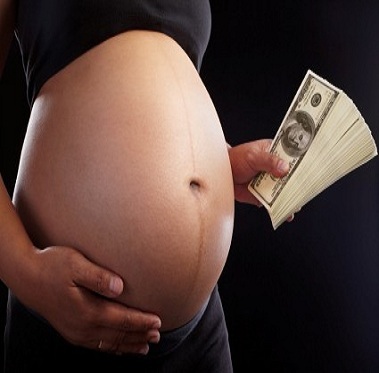 IVF Cost in India is Pocket-friendly to Intended Couples ! With no doubt to say that infertility has its space stressing in the society as it takes off essence of parenthood out of couples’ lives. Meaning that this kind of growing medical cause becomes wrinkles over forehead of those who are to struggle with parenthood to have, so there is a pleasant range of best fertility treatments available such as IVF India. With IVF, a method of assisted reproduction, a man’s sperm and the woman’s egg are combined in a laboratory dish, where fertilization takes place. The resulting embryo gets then moved to the woman’s uterus to implant and develop naturally. Usually, two to four embryos are placed in the woman’s uterus at one time. Also keeping in mind this kind of fertility cycle, it is also needed to consider that the average IVF cost in India is less than costs in U.S.A. and U.K. If any fertility clinic comes customer-oriented, then ask them their price quote that includes everything such as fertility drug purchases, ultrasound and monitoring costs, blood work, and any options. The average cost of IVF in India would be from Rs. 1,90,000 to Rs. 2,80,000 which is USD $ 3,000 to $ 4,000 including the costs of hormonal medications. In the USA, an average cycle from egg retrieval to embryo implantation costs $12,400. The cost of IVF rather reflects the costliness of the underlying healthcare system than the regulatory or funding environment, on average for a standard IVF cycle in United States. While in Ireland, IVF costs around €4,000, with fertility drugs, if needed, costing up to €3,000. The cost per live birth is really highest in the United States ($41,000) and United Kingdom ($40,000) and Japan (both around $24,500). 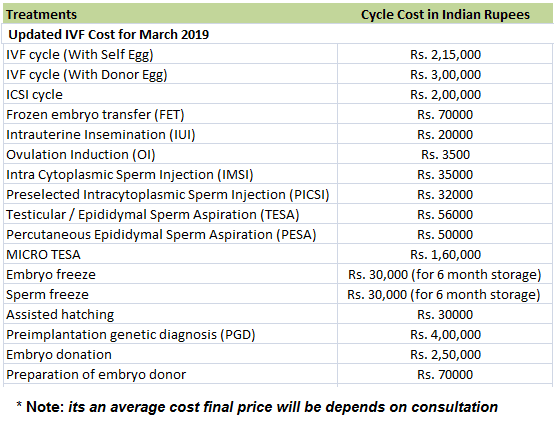 How much does IVF Package Costs in India? Preliminary male and female investigations, blood tests, ultrasounds etc. For IVF treatment cycles, your fertility specialist may need to set down some medications that are not covered by us. Also you are enabled to collect these from us at a lower cost than an external pharmacy. If your treatment comes with advanced diagnostics or analysis, there are additional costs. These procedures are carried out in our own state-of-the-art laboratories. Altogether it is needed to bear in mind that trying to find the costs associated with infertility treatment may be annoying. We have come with liable IVF cost information from more than 20+ clinics in all over the country. 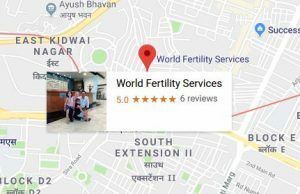 As the most clinic websites do not list pricing in fact, some clinics have relationships with financing organizations and offer little information about IVF expense India. Here, we also include the American Society of Reproductive Medicine that lists the average price of an in vitro fertilization (IVF) cycle in the U.S. In addition, we have sought to find the price of intrauterine insemination (IUI), one IVF cycle using fresh embryos, and the additional charges for intracytoplasmic sperm injection (ICSI) and pre-implantation genetic diagnosis (PGD) from a cross section of clinics throughout the U.S. According to the American Society of Reproductive Medicine, the average cost of an IVF cycle in the U.S. is $12,400. Yes, this price will differ depending on where you live, the amount of medications you are required to take, and the number of IVF cycles you endure. Also be aware that some carriers will pay for infertility drugs and monitoring, but not for the cost of IVF or other artificial reproductive technology. E-mail communication with you from the IVF Specialist on your reports and your queries. Skype Call and International calling to you by us and IVF specialist. Arrange all your accommodations in India at low cost by us for our long staying clients. How do I begin the IVF process in India? At us, you can contact us by filling out a form or e-mailing us. We will find the opinion of the IVF specialist and send you a few medical tests list that she is to need to opine on your case. Also we will e-mail you the profiles of egg donors to choose from. Once these medical tests are reviewed by her, we could plan for your ICSI cycle as per your schedule. At us, no advance payment is required for IVF Treatment. For egg donor recruitment prior to your arrival, only the egg donor cost needs to be wired to the IVF specialist’s account on confirmation. Also Rest of the payment gets made while your visit in India for treatment. These are Females from middle-class of India who are primary educated, with normal physical characteristics, height between 5 ft. to 5.5 inches, weight proportion according to height. All of our donors who are selected in donor program are the highly-fertile and are willing to donate for you. Besides to acquaintance of Indian regular Egg Donor, it is also recommended to tell you about its cost is 1500 USD dollars. At, these egg donors are offered with an Indian premium Egg Donor cycle. To view our entire costs for Egg Donor with an IVF cycle, and to make you comprehended cost with our Indian premium Egg Donor cycle, we point upon 3000 USD dollars. How much does exact IVF cost in India at your clinic? The cost of IVF at our clinic (World fertility Services) in India is merely around INR 1,00,000 to INR 2,20,000 inclusive of all the charges without any additional amount being charged in addition to the costs of IVF treatment for such an amount from the childless couples in order to complete the family of the couples with their own blessed child. Is there any extra amount on taxation or GST on billing? There must not be any amount for the treatment of fertility to be availed despite of the charges of IVF treatment and no taxation is being charged on the treatment of IVF which is about INR 2,20,000 only. Is Guarantee IVF package available? Since the fertility experts do not provide any kind of guarantee for the fertility treatment for IVF, but the couple can avail the chance of maximum up to 4 cycles or 4 attempts of IVF and it is generally seen that the childless couple can achieve the desired results within such attempts and can get the successful results within such attempts. Is there EMI facility available on IVF costs payment? An appropriative facility relative to EMI is available at our clinic (World Fertility services) with some down payment With 0% Interest Rate and rests of the amount in easy 6 or 12 equal installments of the payment for the treatment of infertility in the form of IVF. 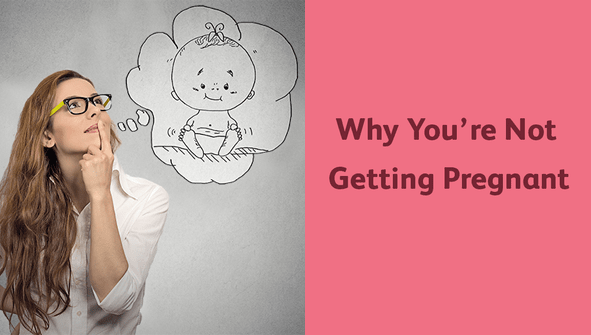 Is there any hidden cost included in your IVF package? No additional or hidden cost is being included within the treatment package of IVF once you have your full settlement of INR 2,20,000 the consultants do not charge any part payment or any other additional payment for the treatment of fertility to be provided at our clinic, World Fertility Services. Is it really affordable for me? The cost is really affordable even for all the childless couples whether the couple belongs to India or may belongs to any other country of India and also the costs must be suitable for all the sectors of the country whether the rich, poor or middle all can afford such a reasonable amount.